At this size and price point they stand shoulder to shoulder with the best. Well worth trying. Excellent well balanced sound. Great build quality. Superb imaging. "What's quickly apparent is the excellent tonal balance and fantastic stereo imaging"
On the rear panel you get XLR and phono inputs, an IEC power socket, a power switch and two dipswitches for volume and filter controls. Once those are plugged in and powered up, set the volume on the knob on the front panel and you're good to go. First impressions are excellent. Having played a wide variety of music, what's quickly apparent is the excellent tonal balance and fantastic stereo imaging. Whereas in the past we've often struggled with the very high end response of Ribbon systems, Eve has really nailed it here. These tweeters boast detail in spades yet sound smooth and even. The very high end is still there but balances down to the mids in a nice, natural way. Low end response is equally impressive, and for a speaker of this size there's plenty of bass extension. Obviously the cabinet and driver sizes will limit the ultimate response possible but Eve have managed to eke out every last drop. The rear mounted porting certainly seems to do the trick. The big test for us is always when we play the bass, because if there any problems or dead spots we feel them straight away. There are none with the 207's. No sir, it's a warm tone and precise balance across the range of the instrument all the way. Eve's excellence is continued during mixing, with plenty of detail present when EQ'ing and compressing. You can hear the subtlest of changes, leaving you with little doubt over what you're doing. On acoustic sources the environmental detail of rooms is excellent, and when adding spatial effects like reverb and delay the stereo imaging comes into play. As a result, blending sounds into the space you're trying to create is simple and translates well to other speakers. Transient response is superb over the whole range, bass is punchy and fat, and snares and percussion are clear and detailed. All these individual plusses mean that getting the overall balance is simple because the detail is there right across the spectrum. Should you need to adjust the 207's to your room, the onboard DSP gives you a fair amount of control. If you sit the speakers on a desk meter bridge there are specific filters that can cut at 170Hz by up to 5db but also boost at 80Hz by up to 3db. This is nice to see as it's not always a bass rise that causes problems. In addition, you can boost and cut LF (shelf at 330Hz) and HF (shelf at 3kHz) with a range of -5db to +3db. These work well and mean you have a degree of tonal shaping available to suit your room and personal tastes. For a small(ish) speaker, the 207's get loud. Our control room is quite large but we had no problem filling the space with their sound and therein lies the last thing to say about them. That excellent overall tonal balance stays across the entire volume range. Whether loud or quiet, the ratio of low to high stays even and balanced so for those moments when you can't monitor loud you'll still get the truth. 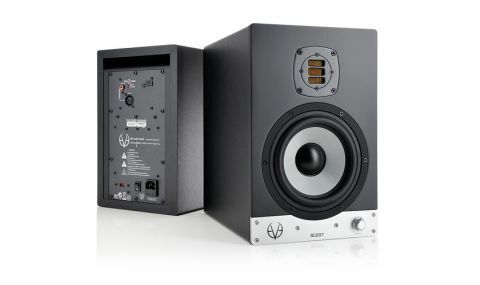 These are a great set of nearfield monitors that will surely find their way into many professional environments as well as proving perfect for a project or home studio.